You can save the stats for each of your classes and come back to it later! Enjoy, leave feedback and show your friends! Thanks for making this! It's a lot less confusing than some of the other damage calculators I see out there and for me it's already quite accurate. Looking forward to the additions coming soon. Sick!!!! Bookmarked. If I had Twitter or FB i would tweet/like this . Very accurate, though I noticed that its slightly off for me. NN (101504, 896.5,100) Heuric Haxstar 3, no martial crit 22 576 916 (instead of 22 576 393), martial crit 56 442 292 (instead of 56 440 982). Its off by <0.01% but I thought you might want to know nonetheless. Very likely its because of some very small "invisible" crit dmg numbers (<0.1cd). It's a lot less confusing than some of the other damage calculators I see out there and for me it's already quite accurate. Glad to hear! I've been meaning to make this for a while for that exact reason; fiddling about in spreadsheets can get annoying and confusing. Thanks! 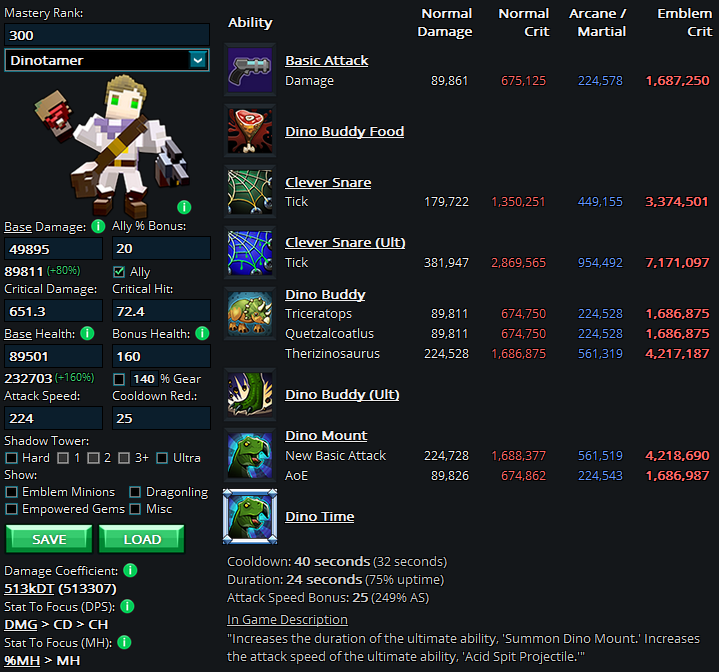 I hope it's alright that I'm using Trove's UI elements and graphics. I know it probably falls under fair use and all, but I like to make sure it's consensual! Yep, unfortunately (as I mention in the disclaimer at the bottom left) Trove rounds numbers in tool tips and character sheets, so the higher the damage, the more it might be off by a little bit. Another example is my GS, which with a charged shot's direct hit does 409774 damage, suggesting that its magic damage is somewhere between 102443.5 and 102443.6, but it displays 102444. It's a slight annoyance, but maybe the positive aspect is that people can play around with the numbers to find their "true" damage and crit damage. Though, I'm hoping that with the new additional breakdown displayed when hovering the stats (on PTS right now) they'll be willing to show us some more decimals. Lancer needs calculation for when in lunacy mode. also, a row for the hard ST boosts (50% and 25%) would be nice. other than that, this is awesome! Under mastery rank 20? Want a free class coin to unlock your favorite class? Click here! As I mentioned above, I'm already working on these features. Currently doesn't work on mac/ mobile devices, which is a shame since the main house computer died and I can't use it. Will there ever be a version for mac? Seems really clean and easy to use compared to other calculators. Old URLs might be a bit faulty now, sorry about that. Also, make sure you use your base damage from now on (hover the stat sheet)! Thanks for bringing it up, should be fixed now. Let me know if there are still any issues!